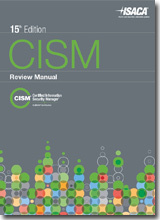 The CISM Review Manual 15th Edition is designed to help you prepare for the CISM? exam. This comprehensive, easy-to-navigate manual is organized into chapters that correspond to the four job practice areas covered in the CISM exam. The Manual is primarily designed as a tool for exam prep, but can also be useful as a reference manual for information security managers.